Its simply delicious .Try it out .U'll luv eating it again. 5 cashew nuts broken into small pieces. Then put b.soda and curd and mix well and keep it aside for 4-5 hrs.if u like to have the idli bit sour u can leave it overnight at room temperature. After 5 hrs , put little water around 1/4 cup to bring consistency to the batter , add mixed vegetables , chopped green chilli, minced ginger , salt and sugar and mix . In a pan , put 2-3 tbsp ghee , when hot put mustard,when it splutters,put cashews broken , chana dal,jeera and curry leaves and pour this tadka onto the batter and mix well . grease the idli plates with ghee and pour in a ladle this idli batter into the idli plates and steam it for 10-15 minutes . 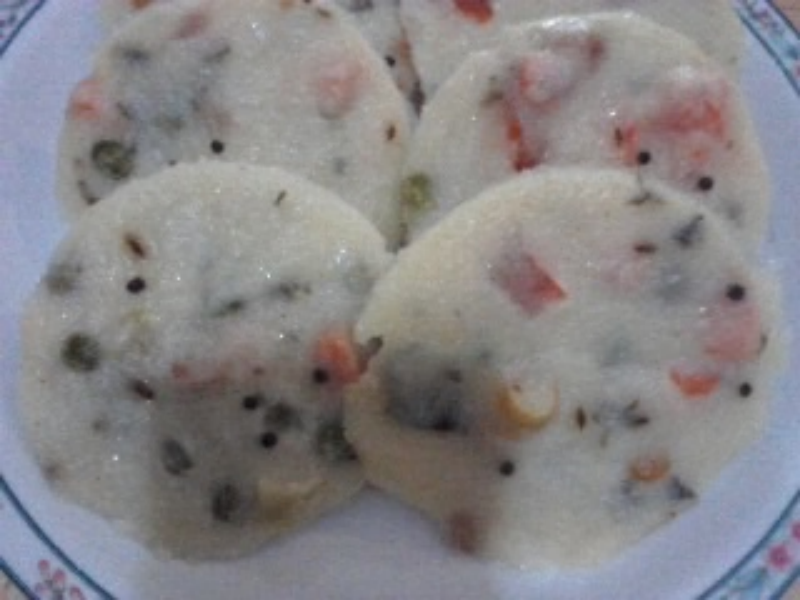 Remove it from idli plates and serve hot with your choice of chutney. u can use bicarbonate soda.If i'm not wrong both r same.this is used as a rising agent.try it out .u'll like it.